In today’s Almond Matters, brought to you by Valent, ant management strategies rely on diligent monitoring and the correct identification of any ant species growers may find in their orchards. Tollerup noted that there are several different types of ants that may appear in almond orchards, but not all of them present any direct risks to the crop. 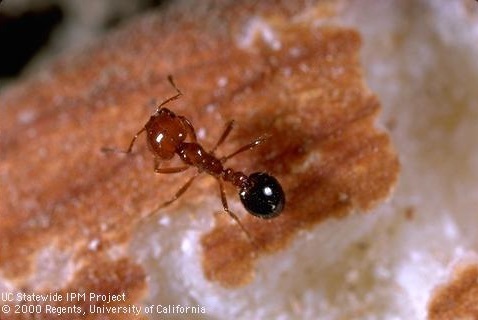 “The UC IPM guidelines list two species that are a problem as pest ants on almonds and that’s the southern fire ant and the pavement ant…so you want to make sure that you have at least one of those two pest species before you go applying a bait,” Tollerup said. Once a proper identification has been made the next step in the process is choosing the best ant management approach. Using a material that kills ants quickly is not ideal, as it will not be extremely effective. Since ants share food with each other a material with delayed toxicity, such as an insect growth regulator, will be spread throughout the colony and have a greater likelihood of killing the queen. “What I’ve seen in the past that works very, very well is to come in early with an insect growth regulator…and then in late June come in again with one of the stomach poisons,” said Tollerup. Damage caused by ants can depend on varieties, with nonpareil being more vulnerable due to having softer shells. Tollerup mentioned a correlation between the amount of damage caused by ants and the amount of time that almonds are left on the ground in orchards. “Those two species, the southern fire ant, and the pavement ant get in there and actually feed right on the nut meat,” Tollerup stated. Listen to Tollerup’s interview below.